When someone tells me there’s a bar called “Church,” certain images come to mind. I kind of expect a hipper-than-thou club in some lesser-known corner of downtown or the Financial District; an area that would be deserted after hours. It would feature a DJ with a moniker like “the Reverend” and would probably attract a black-clad, neo-goth crowd ordering drinks from waitresses dressed as slutty nuns. The inside would be very dark, save for creepy red lighting, and there’d be a $20 cover. So when my sister Kelly told me there was indeed a bar called Church in Boston, I was pleasantly surprised to discover that it was nothing like I expected. To begin, it’s not down some dark alley in downtown Boston – it’s in a residential area near Fenway Park. And it’s not an uber-trendy club – it’s a very cool cocktail bar and restaurant that manages to maintain a neighborhood feel. Still, I might expect a place with a name like Church to be heavy-handed with pseudo-religioso décor. Again, no. 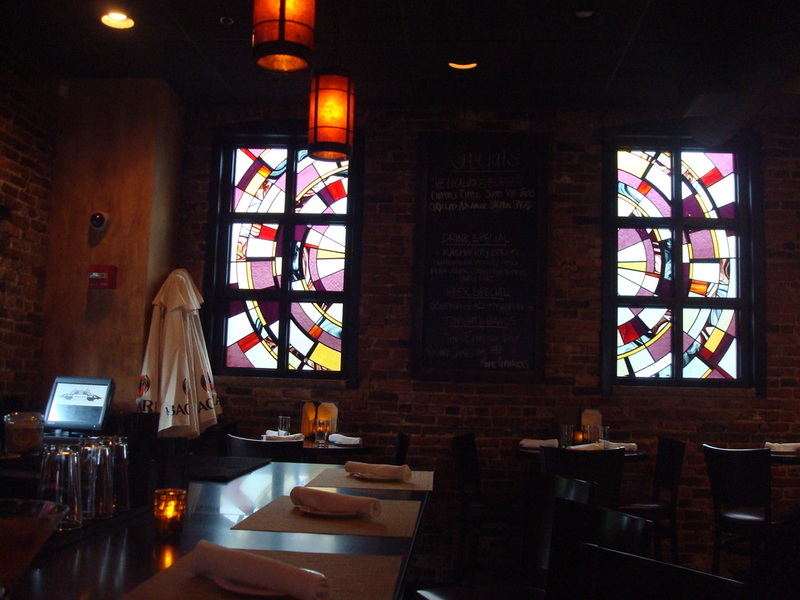 There are some cool stained-glass windows, a stone floor that I suppose could be reminiscent of a medieval cathedral, a black granite bar illuminated by dark orange hanging lamps, and softly glowing votive candles on the tables, on the bar, and even amid the liquor bottles. But the golden-brown walls provide a warm, modern contrast, the candles are battery-powered, and the staff is so friendly – there’s no way this place could be as somber as a gothic church. OK, there might be a framed picture or two of a gargoyle. The bar and restaurant side of Church (there is indeed a club side, too, but we’ll get to that later) is a moderate-size space. 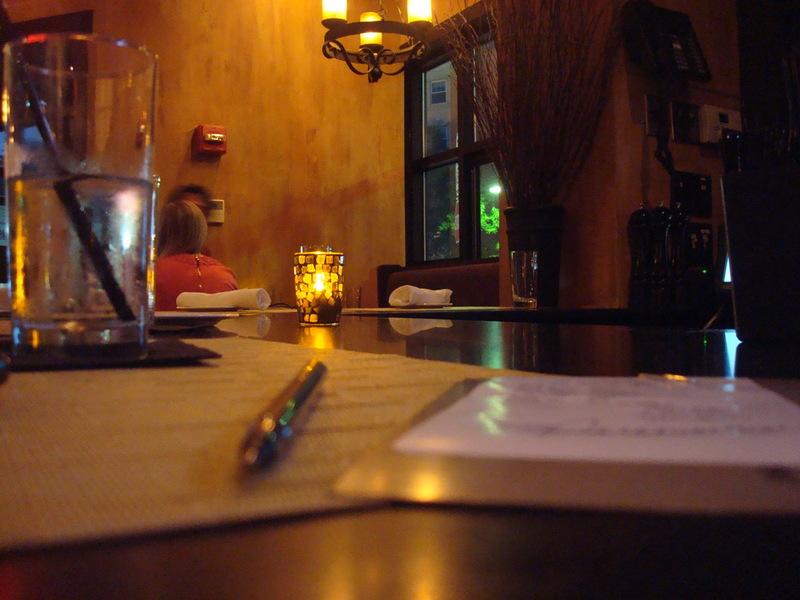 There are about ten seats at the bar and six small tables in the immediate area. In between the bar and the dining section is a set of couches that you can snag if you’re lucky. The dining area, with a dozen or so tables, looks onto a quiet residential street through large windows framed with thick, burgundy curtains. I would call Church a very chic but highly casual bar with upscale comfort food, an amazing staff, and some excellent drinks. I was impressed with this place even before I opened the cocktail menu, but when I did…well praise the Lord! Not only does Church contribute to elevating the art of mixology, it describes its drinks in one of the most interesting manners I’ve ever seen. Church’s specialty cocktails are divided into two biblically themed sections: Seven Deadly Sins and the Four Horsemen of the Apocalypse. A drink for each sin, and one for each Horseman. Let’s pause a moment and consider the coolness of this, shall we? Yeah, that’s awesome. If you know a few things about New Orleans and whiskey, you can probably deduce that War is Church’s version of a Sazerac. If you don’t bring that knowledge, even better. I mean, seriously – who describes a cocktail like that? Some places merely list the ingredients in their drinks; some boast that theirs is the best in the city. At Church, they’re establishing a mood, evoking an image, piquing your curiosity. What’s the worst that can happen? Maybe you end up with a drink that has an ingredient you don’t care for, but it’s part of the adventure. You’re in Church, after all; have a little faith! I’ve been to this bar on three occasions. The first was on a Saturday evening with Melissa and our friends Jack and Jenny. The second was a brief visit by myself, and the third was with Melissa and Kelly. Over the course of those visits I’ve ordered or tried nine of Church’s eleven specialty cocktails, had dinner, ordered a slew of appetizers, and indulged in a few desserts. So make yourself comfortable while I spread the Good News. We start, of course, with the drinks. On my first visit, with Melissa, Jenny, and Jack, I made a beeline for the Seven Deadly Sins. I started with Sloth (no snickers from the peanut gallery, thank you). Sloth is Church’s version of a Manhattan, and they stay true to the classic recipe. The menu advises you to take it slow with this one. I find few cocktails more relaxing than a well-made Manhattan, but I admit this one disappeared pretty quickly. Jack went for Wrath, though it would be difficult to stay angry with a smooth drink like this in your hand. This one was made with New Orleans-style Sazerac rye, fantastically seasoned with allspice, basil, and peppercorn. The allspice stole the show here, giving the drink a rich, unexpected flavor. Jenny opted for Conquest, of Four Horseman fame. When you think of tequila and strawberries, you probably think of a margarita. This was nothing like a margarita. Church uses dark, bourbon barrel-aged tequila, mixed with rhubarb (I figure you really gotta know your mixology to properly put that in a drink) and agave nectar, topped with fresh, sliced strawberries. The dark tequila, more complex in flavor than white as a result of the aging process, truly distinguished Conquest, and the way the flavor worked with the strawberries was beyond words. As she drained the glass, Jenny stood up, drew an imaginary sword from an imaginary scabbard, and declared herself a forgotten daughter of Cortez, the blood of a conquistador flowing hotly in her veins. Tequila affects people in different ways, I’ve found. In addition to their regular cocktails, Church features rotating drink specials. Melissa went that route, getting a drink called Prairie Rain – vodka, maraschino liqueur, ginger beer, and rhubarb bitters (I’ve gone from never encountering any sort of rhubarb flavoring in a drink to seeing it twice in one night!). It may have lacked the thematic moniker of our other drinks, but it was no less satisfying; the crispness of the ginger beer and the freshness of the rhubarb bitters gave this a truly unusual and refreshing flavor. With this cocktail we have dressed Death in velvet, walked her down the cobbled streets of Toledo, where to this day she dances with the “la fee verte”, locked in a perpetually effervescent prison. The key is yours now. Yeah, that’s awesome too. I was expecting a thick, dark drink, but Death never looked so elegant and peaceful. The effervescence came from Champagne or Prosecco; unfortunately there was a licorice flavor in there, which I loathe, so it’ll be a long while before I dance with Death again (I hope). By the time of my third visit, with Melissa and Kelly, I almost felt like a regular Church-goer. We came on a Tuesday night at about 5:30 when the Sox were out of town – which of course, you must always account for when coming to drink in this part of the city. The place was pretty much dead at that hour, so we made ourselves comfortable at the bar. The slow night gave us a chance to talk to our bartender, Tara, and watch with reverence as she artfully crafted our cocktails. Tara took great care of us and was a good sport when it came to talking about the bar and her approach to making drinks. Kelly opened the proceedings with Greed – Hendricks gin, St. Germaine, diced cucumber, a pinch of white pepper, garnished with a salted cucumber. Anything with Hendricks is good, but this drink was crisp and invigorating. You’d get a sense of the cucumber whenever you took a sip, and the pepper enhanced the cucumber aroma. Melissa took a page out of Jenny’s book and went for Conquest (minus the imaginary sword bit…which, honestly, didn’t really happen). I also felt like going another round with the Horsemen, so I ordered Famine – probably my favorite drink of the night. This combination of Guatemalan rum and walnut liqueur was rich and naturally sweet, but not cloyingly so. One of the benefits of being in a sparsely populated bar with a friendly and attentive bartender is that when she overhears you contemplating your next order, she can help you make your choice. Kelly was thinking about giving Vanity a try, and since Tara was mixing up a batch for a few other customers, she offered her a sample. As I’ve noted before, getting a cocktail sample is much rarer than getting a beer sample. You really don’t encounter this kind of service in a lot of places, and I want to make sure it doesn’t go unnoticed. Vanity was exquisite. A cocktail of Champagne, vodka, freshly squeezed ruby red grapefruit, and lemon twists, this baby was sweet, tart, and dry all at once. While Melissa sampled Church’s wine selection, Kelly and I closed out our nights with Envy and Gluttony, respectively. Envy is a delicious vodka drink with diced kiwis – when’s the last time you had kiwi in a drink? And Gluttony was aptly named. It was very much a dessert-type cocktail, with rum, bananas, Thai coconut milk and – are you ready for this? – topped with a cocoa-dusted mint leaf. Good Lord! A sinfully decadent way to close out a night. Now you can drink all these amazing cocktails ‘til kingdom come, but if you don’t have some food to accompany your libations, you’ll be on your knees praying to a different type of god, waking up with a hangover of biblical proportions. Thankfully, Church’s food menu is as satisfying as its drink options. Church has an impressive variety of appetizers and dinner options. After a brief wait (not bad for a Saturday night when the Sox were in town), Melissa, Jenny, Jack, and I got a table for dinner. Unfortunately, I’m a little short on food pictures from that night – as it turns out, the light of a votive candle doesn’t exactly provide ideal shooting conditions. So, in short – we were all impressed with the food. We started with the novel grilled cheese sliders, complete with a bowl of spicy tomato soup for dipping, and crabcakes with chipotle aioli. Mel, Jack, and Jenny all hail from the Chesapeake Bay region of Virginia, so their expectations of crabcakes are snobbishly high. Forget the lighting – they disappeared before I could even turn my camera on. Our entrees were even more satisfying. While I tend to avoid pulled pork at non-BBQ restaurants, I was very pleased with Church’s pulled pork sandwich, which came on a crunchy roll. Jenny, rattling her imaginary saber, boldly and loudly declared her fish tacos “fit for a daughter of Cortez,” Jack dug his tuna steak, and Mel was as pleased with her salad as one could be with a salad. When I returned with Kelly and Melissa, we contented ourselves with appetizers at the bar. I’m a fan of any place where you can be wholly satisfied with a few apps, and that’s definitely the case at Church. Mel immediately went for the grilled cheese sliders, since they were such a hit on our previous visit. Add to that sloppy joe sliders and a spring herb hummus, and we were three happy customers. Next up was a country fried chicken appetizer. It was pretty good, but an odd combination of flavors. The fried chicken came atop a waffle, and was drizzled with a green, savory garlic gravy. Mel wasn’t digging it, but that meant more for Kelly and me (and Kelly was full at that point, so it was pretty much mine all mine). Our final appetizer was our most daring choice – tuna tartare. This was raw tuna served on half an avocado. Phenomenal. The flavors worked perfectly together, and a freshly squeezed lime put it over the top. Insert your own “gluttony” joke while I regale you with our adventures in dessert. With Jack and Jenny, we ended our evening with bread pudding and a strawberry rhubarb crostada (rhubarb! Yet again!). Both were sinfully delicious, but the bread pudding took the prize. And since Kel, Mel, and I passed on entrees, we felt justified in ordering Church’s flourless chocolate cake. Now this isn’t something I’d ever order; I hear “flourless” and think “flavorless.” But Tara gave it high praise, so Mel ordered it. For a flourless cake, it was surprisingly moist and dense. It wasn’t overly sweet, but it drew a rich, balanced sweetness from the cherries, cream, and cherry syrup on top. Not what you’d expect from a flourless cake, and I’d recommend it. It was a perfect end to our evening. Amid the great drinks, delicious food, and friendly atmosphere, I had forgotten that question I first asked myself – why the hell did they call this place “Church”? Because there are a couple of stained-glass windows and come cleverly named drinks? If the bar was housed in an abandoned church, I could understand it; but as far as I can tell, that’s not the case. But when I think of church as a community place, a neighborhood destination where people come together in celebration of a common cause…it makes sense. Local and friendly, upscale but laid back. It’s actually the kind of place I’d consider going once a week…even if it’s not on Sunday. As I noted in my review of Audubon Circle, just finding a place in the Kenmore/Fenway area that doesn’t exist solely for the purpose of attracting game-day Red Sox fans is rare. And to happen upon a bar as unique as Church is akin to having an epiphany. Church would be an ideal location for a date. It’s a bit on the fancy side, so you’d impress your partner; but the atmosphere is undoubtedly warm, casual, and intimate. The drink menu itself is a conversation piece, and once you lubricate the conversation with those excellent cocktails, you’re all set. Or if you haven’t got any hot dates planned but are coming with a group, try calling ahead to reserve the couches. Price-wise, it’s a little high, but not too bad for the city. Entrees range from $11 to $25, but most of the appetizers are $10 or less, and all those cool drinks are an even $10. There’s even a parking lot out back that’s free when the Sox aren’t in town. As I mentioned, there’s even more to Church than innovative cocktails and comfort food. Although part of the same building, there’s a separate room for live music where local and touring rock bands play. The cover charge varies depending on the band playing there, but if you get in before 8:15, you should avoid the cover altogether. And if I understand correctly, there’s no cover on Tuesdays. I haven’t been to the music side yet, but it sounds pretty casual – pool tables, TVs with the game on. I can’t wait to get there soon and write a follow-up post.